Characteristics: Ruby purple color with ripe red cherry aromas and vanilla. 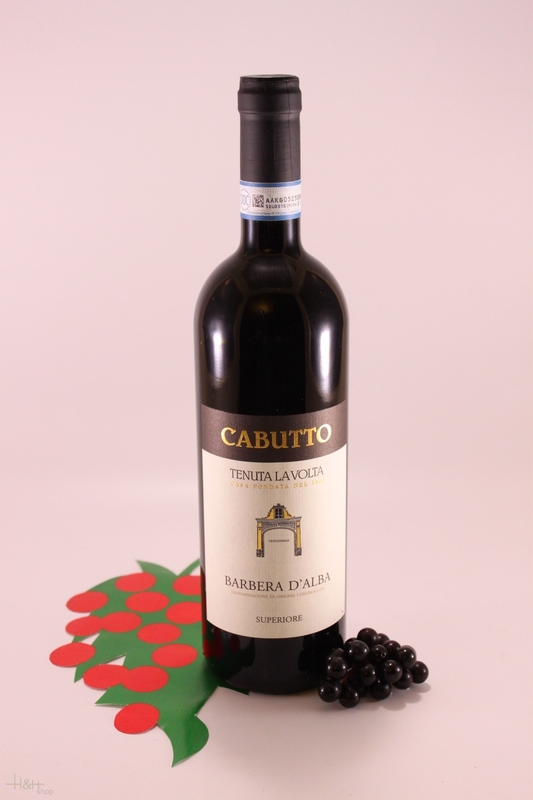 With hints of violets the Barbera d'Alba Tre Vigne is slightly rounder in structure than the Barbera d'Asti. On the palate it shows bright acidity, soft tannins with good integration of oak, good complexity and a lingering cherry finish. Food pairings: Antipasti, rich salads, grilled seasoned vegetables, hearty soups/stews, pastas or with breaded veal, pork, chicken with light sauce. "Wine Spectator" has rated the wine "Cabutto Tenuta La Volta Barbera d'Alba Superiore, Piedmont, Italy" from the vintage 2005 on 15.12.2007 with 85 of 100 points. "Wine Spectator" has rated the wine "Cabutto Tenuta La Volta Barbera d'Alba Superiore, Piedmont, Italy" from the vintage 2004 on 31.12.2006 with 88 of 100 points. "Wine Spectator" has rated the wine "Cabutto Tenuta La Volta Barbera d'Alba Superiore, Piedmont, Italy" from the vintage 2001 on 15.11.2003 with 82 of 100 points. "Wine Spectator" has rated the wine "Cabutto Tenuta La Volta Barbera d'Alba Superiore, Piedmont, Italy" from the vintage 2000 on 15.11.2002 with 85 of 100 points. "Wine Spectator" has rated the wine "Cabutto Tenuta La Volta Barbera d'Alba Superiore, Piedmont, Italy" from the vintage 1999 on 30.11.2001 with 89 of 100 points. "Vinum Wine Magazine" has rated the wine "Cabutto Tenuta La Volta Barbera d'Alba Superiore, Piedmont, Italy" from the vintage 1998 on 01.12.2000 with 13 of 20 points. "Wine Spectator" has rated the wine "Cabutto Tenuta La Volta Barbera d'Alba Superiore, Piedmont, Italy" from the vintage 1998 on 31.08.2000 with 85 of 100 points. "Wine Spectator" has rated the wine "Cabutto Tenuta La Volta Barbera d'Alba Superiore, Piedmont, Italy" from the vintage 1997 on 15.09.1999 with 79 of 100 points. "Wine Spectator" has rated the wine "Cabutto Tenuta La Volta Barbera d'Alba Superiore, Piedmont, Italy" from the vintage 1996 on 31.10.1998 with 75 of 100 points. "Wine Spectator" has rated the wine "Cabutto Tenuta La Volta Barbera d'Alba Superiore, Piedmont, Italy" from the vintage 1995 on 31.10.1997 with 80 of 100 points.